The Port of Melbourne Corporation (PoMC) have just announced that Maritime Cove, which includes the Perce White Reserve, the new boardwalks, Webb Trail and the new observation platform at Webb Point, will be fully opened from Monday 8 June. This week's works notice can be downloaded here. Details of the planned weekend closure of Todd Road from 8pm Friday 29th May to 5am Monday 1st June can be downloaded here – detours will be in place as per previous weekend closures with traffic diverted via Salmon Street. Please note that additional weekend closures are planned for mid-late June, additional details to be circulated closer to the time. If there are any concerns regarding the closure or if traffic hazards are observed please call the PoMC on 1800 451 056 (24/7). Please note that yesterday the contractor made a decision to cancel this week’s night time impact piling works under the West Gate Bridge, transferring this activity to normal daytime working hours. As the weekly works notices are already being distributed, this change has been reflected on the Webb Dock Live website. This week's works notice can be downloaded here. Note that the closure of Todd Road this weekend has been cancelled. Port of Melbourne Corporation has just issued a notice (download here) about piling works to commence this evening along Todd Road near the West Gate Bridge. For those of you intrigued by the container ship (the MSC Florida) currently berthed at Station Pier, the Port of Melbourne Corporation (PoMC) have advised that it will be there for the next week or so as it is undergoing essential maintenance. Any questions can be directed to the ship’s agent, MSC Australia. 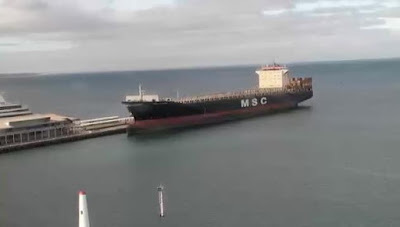 Here is a picture of her at Station Pier, taken from the port webcams. A fact sheet on the Fishermans Bend Urban Renewal Area (FBURA) has just been released and can be downloaded here. The media release from the Planning Minister can be downloaded here. We received this later than normal so sorry for the delay. The latest works notice can be downloaded here. Please note that information on Webb Dock works and related issues (eg road closures) can be also found here. The sessions will be attended by representatives from MIRRAT, the new Automotive Operator, and McConnell Dowell who are currently undertaking the maritime works including piling.